Panguni is the 12thand the last month of the Tamil calendar, which corresponds to March–April and is also known as Phalgun. Uthiram or Uttara Palguni is an auspicious star. Panguni Uthiram is the day when the star Uthiram falls in the Tamil month of Panguni. The day gains more importance as the full moon coincides with the occasion as well. Panguni Uthiram is the occasion that lays great stress on Grihasthya, the institution of marriage and the life of a married individual. The Hindu dharma attaches a lot of importance to the householder and lays strong emphasis on the duties he is required to discharge, entrusting him even with the responsibility of taking care of those sections of the society, who are incapable of sustaining themselves. This day, highlights the bonding between a man and a woman who enter into wedlock, so that together, they can uphold the principles of righteousness and support the society, show the way to lead a married life that can lead you to salvation. It is on this Panguni Uthiram day, according to Valmiki Ramayana, the divine incarnations Rama and Sita entered into wedlock. Muruga, too, married Devasena or Deivanai, while Shiva and Parvati are also said to have united in the sacred relationship, on this day. 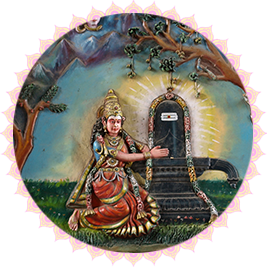 As the occasion is inexorably connected with the institution of marriage, Panguni Uthiram is observed with the celebration of divine marriages in temples between Gods and Goddesses . The ceremonial marriages of Shiva and Parvati, Muruga and Deivanai, Rama and Sita, Ranganathar and Andal etc. are all celebrated in both, Vaishnavite and Shaivite temples. Maha Lakshmi, the goddess of wealth and prosperity is also believed to have emerged from the ocean of milk on this day and hence, people worship her too. Panguni Uthiram is also regarded as the day of incarnation of Lord Ayyappa . On this day, people offer special prayers at homes. They also visit temples in large numbers and perform rituals and worships. While special Poojas are done in many temples, including the Sabarimala Temple at Sabarimala in Kerala, Panguni Uthiram is observed with great fervor especially in Muruga temples. Devotees observe various austerities, like going to his temples on foot, carrying Kavadis (decorative arch) and pots of milk, piercing their bodies with lances and needles, rolling around and circumambulating his shrines etc. Offering worship to the Gods, especially to the divine couples, on Panguni Uthiram can bestow you with the special blessings of the Gods and Goddesses. This can fundamentally help the couples to build a congenial bonding. While this ceremony can be a good remedy for problems like delay in marriages, marital discord, health issues of life partners etc., the worship can also help in attracting the soul mates, increase intimacy among them and ensure a long and happy marital relationship.